Today’s writing prompt is “Weird Stuff.” I think the prompt idea is working. I already have 4 pages filled in my January journal. 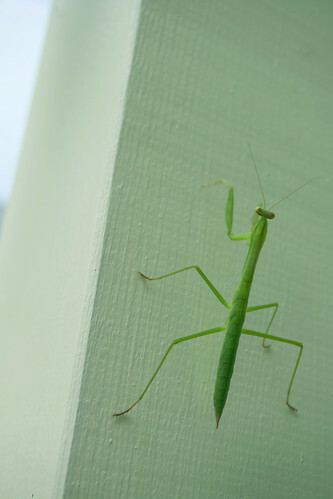 I did a bit of digging through my photos and found a praying mantis. I think they are pretty weird with their overlarge eyes and the way they seem to watch you watching them. I think one would eat me if I were a bit smaller. Seeing one eat another insect isn’t weird. It’s downright disgusting. Did anyone ever wonder why there are circles of crop land in the Midwest? It turns out they are due to center-pivot irrigation. It makes sense but the circles are weird-looking to me. Enough weirdness for one day. Thanks to Tara Lazar and her Story Storm for today’s prompt.